Since I was young, I was always the kid in the group of friends telling people off for littering. I knew I was always more interested in science, so when I was deciding what to study, it was simply a choice between different kinds of natural sciences. Australia is so naturally beautiful and I have always wanted to study here. I started researching different universities around the world when I was in middle school. I found that James Cook University is one of the top universities in the world for student experience for Environmental Science*. So studying at JCU was always in the back of my head — it was actually the only university I applied for. I decided to study at the Cairns campus as it had the option to start mid-year, which was handy as I was able to save some money working in Norway before I came to Australia. I loved studying at the Cairns campus. It’s small in comparison to other unis so instead of just being a number, you are actually a person that they know by name. I felt that the lecturers in our first year in particular were supportive. They were accommodating and approachable, which helped to make the transition into studying as smooth as possible. The field trips and the practical experience I gained throughout my degree were amazing. I loved it. We did field trips to the rainforest, the beach, and the Tablelands Region. I also selected a block subject where we travelled to Phuket, Thailand, to study the impacts of overfishing on the ecosystems around Phuket. The trips enhanced what we learnt in our lectures and tutorials. I was able to apply my studies to Small World Journeys, an innovative, local Cairns business. Their focus is on the environment and teaching kids from a young age about Cairns and the Tropics. They focus on the positive impact that the young generation can have on our changing climate. This experience was great for me from a science communication perspective as I created their educational material for their field excursions. I felt that my internships and placement prepared me to enter the work force. 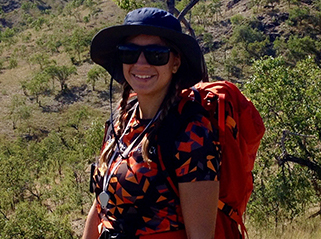 My experience working on real life projects helped me transition into my role as a Geographic Information Systems (GIS) Project Officer with the Great Barrier Reef Marine Park Authority. I would advise future students to choose their subjects wisely. Choose subjects that you are interested in, but also make sure you are studying subjects that build on your employability skills. GIS is a great example of this, it is applicable for many different industries and I believe I am a lot more employable as I focused on ensuring I built my GIS skills throughout my degree. My dream is to go to Antarctica or the Artic and work in either one of these regions. I don’t want to be stuck in an office all day — I want to be out and about conveying the message of science communication.